A number of fainter stars represent the flowing locks of hair of the female figure of Jawza’. In the earliest times, the name “Jawza’ ” referred to only the three bright stars that are lined up in the middle of the figure. 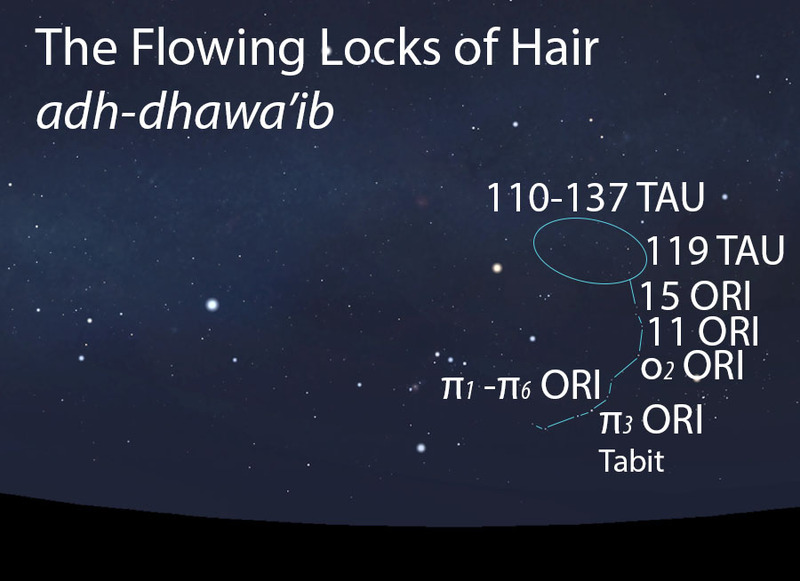 The Flowing Locks of Hair of Jawza’ (adh-dhawa’ib) as it appears in the west about 45 minutes before sunrise in early December. Sky simulations made with Stellarium. A large number of unremarkable stars that start above the Head of Jawza’ and arc around to the right and down her right side. The brightest stars in the group lie in a single line at the ends of her long hair. Ibn Qutayba locates these stars above the head of Jawza’, and as-Sufi only includes the brighter stars along her right side. The Flowing Locks of Hair do not figure in the calendar of the rains stars. The Flowing Locks of Hair do not figure in the calendar of the lunar stations. 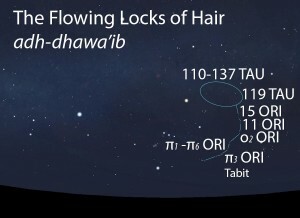 The Flowing Locks of Hair is part of the Jawza’ (al-jawza’, الجوزاء) folkloric celestial complex, which developed over time from the central stars that mark her Belt of Pearls.